Bluebonnets spilled down the slopes, and from where I stood, the distant and iconic Mule Ears rock formation made for a great backdrop on this beautiful morning in Big Bend National Park. Far below, the scenic Ross Maxwell Highway curved its way towards the Chisos Mountains. Overhead, the clouds were beginning to show color as the sun began to warm what was a very cold start to the day. After a 15 minute walk from where I had parked, and with temperatures in the low 30s, my fingers were numb as I worked my camera's controls, but any discomfort was neutralized by the amazing view I enjoyed. 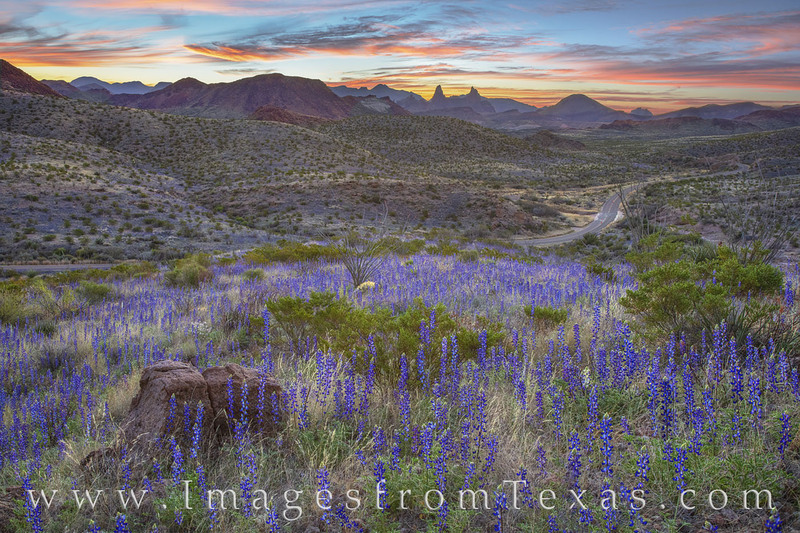 Bluebonnets and Big Bend - nowhere but Texas.